Sweater weather is finally upon us in Dubai! Do the following to make sure your sweaters go from winter 2016 to winter 2017 (and beyond) as if they were brand new. 1. Frequency: A good rule of thumb is to wash your sweater after 4 wears. 2. Washing: Machine-washing damages the most common sweater materials, especially wool. Stick to dry cleaning or hand washing. 3. Drying: DO not wring your sweater when it is wet. Sweaters should be laid flat to dry, not draped over a towel bar (which can leave them misshapen). Beat the crisp, chilly temperatures by covering up in some of the most stylish sweaters. 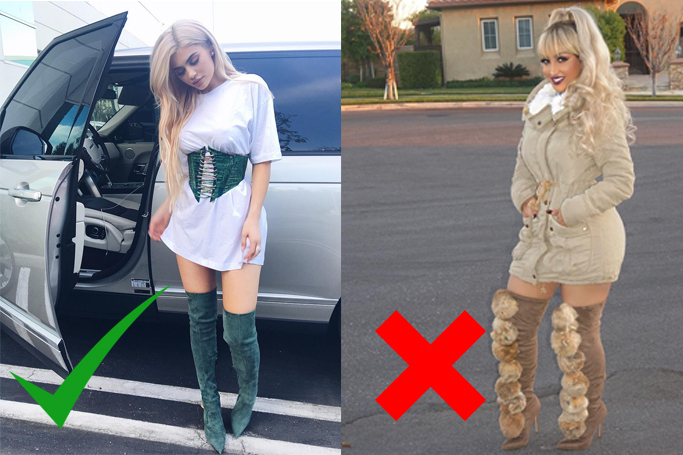 Over-the-knee/ thigh high boots have got a bad rep over the years, partially due to Julia Roberts in Pretty Woman and partially due to how intimidating they can seem to pull off. However, winter 2014 saw the return and revamp of this trend and it has stayed put since. Don't pack away your summer pieces just yet! With just a few simple styling tricks you can take your favourite warm-weather basics into fall. 7 Bomber Jackets You Need Right Now! Tomboy fashion and street-wear fashion had a baby and the bomber jacket was born. The uber comfortable bomber has RULED 2016 like no other trend has. Spotted on the likes of Gigi Hadid, Kylie Jenner, Jessica Alba, Kendall Jenner (this list could go on forever), this jacket is extremely versatile and is perfect if you want your outfit to reflect a 'cool-girl-vibe'. Check out our top bomber jacket picks! Read more about 7 Bomber Jackets You Need Right Now! Chokers are not the only 90s trend that have made a comeback. Velvet, a quintessential 90s trend, has come back in a big way - ruling the runways from Milan to Paris to New York. Winter in Dubai is finally here! Okay, it may not be a typical winter as much as it is a time when people don’t melt walking to their cars – but we’ll take what we can get. So, even though you may not be reaching out for typical winter wear like parkas and gloves, it is the perfect time to rock fabulous lightweight coats and jackets. We bring you a roundup of the must-have coats for the winter season in Dubai.